Our next ARAUNY Book Club meeting will be Tuesday, March 22nd from 6:30-8 pm in Brighton. Please RSVP via our Contact Us page for the exact location. 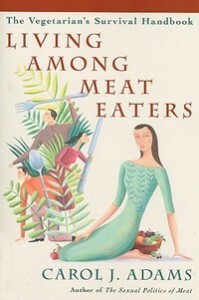 We will be reading Living Among Meat Eaters by Carol J. Adams. I saw plenty of used copies online for $4.99 including shipping. Check out Alibris.com. There’s also one library copy at Central, but this book includes 70 pages of vegan recipes, so maybe you’d like to have your own. The author, Carol J. Adams, is coming to speak at U of R on the evening of Wednesday, March 16th, about The Sexual Politics of Meat (more info). I plan to attend and expect we would also discuss that talk at the book club.